Check out Tobi's I'm Fine Drape Cardigan Warm vibes are here. Reach for the I'm Fine Mustard Drape Cardigan when you feel that chill. This cable knit cardigan features an open front, relaxed sleeves, and gorgeous knitting. For the perfect fall & winter 'fit, wear this cute cardigan with a skirt, mock neck top, and thigh high boots. Warm vibes are here. 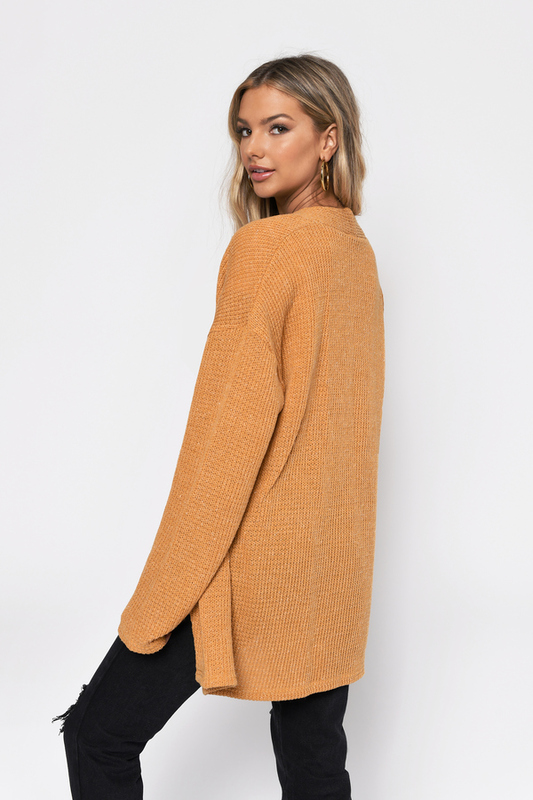 Reach for the I'm Fine Mustard Drape Cardigan when you feel that chill. This cable knit cardigan features an open front, relaxed sleeves, and gorgeous knitting. For the perfect fall & winter 'fit, wear this cute cardigan with a skirt, mock neck top, and thigh high boots.